Behind Jamie's Ranch is the Moonlight Mine. Inside the mine you can find ores, roots, clay, and even the occasional jewel if you go down deep enough. Before you can descend the mine you need to bring your hammer with you. If you don't have a hammer in your inventory, the staircase down to floor 2 will not appear. To drop down to the lower floors, you will need to stand on top of the cracks you see in the floor. The crack will drop you down from 2 to 9 floors at a time, but there is also the chance you'll find updrafts instead! Updrafts will send you up 1 floor, or even as high as 8. Updrafts aren't as common on the early floors, but once you start down into the 80's you'll find a lot of them. While going through the mine you can smash rocks and crystals to find items. 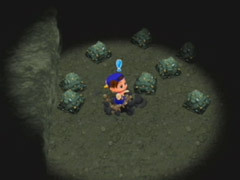 The blue crystals will always have an ore or jewel, but the rocks may not produce anything at all when you smash them. Both can produce gasses, which may help or hinder you for a few moments. Black Gas: The circle of light surrounding you shrinks, making it hard to see. Purple Gas: Flips your diagonal controls. Pressing right might make you go left instead. Orange Gas: Causes paralysis so you can't move until it wears off. Pink Gas: Recharges your stamina if you run around in the gas. Very helpful! Yellow Gas: Makes you run faster than normal. You won't start finding jewels until you get deep into the Moonlight Mine. On the 100th floor of the Moonlight Mine is a small shrine that doesn't have any purpose. If you've brought your Hoe will you, till the ground to find random amounts of money at each swing! Once you've reached the Winter season you can cross the frozen waters of Sunny Lake to reach the Lake Mine. This mine is full of expensive jewels and is a great place to earn a lot of money! The tricky part of the Lake Mine is getting down to the good items. 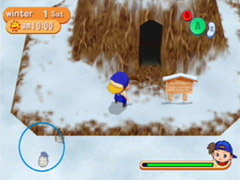 Between floors 2 and 9 will be typical mine items that you can easily find in the Moonlight Mine. Once you reach floor 11 the good stuff begins to make an appearance. It's tricky because the holes in the floors typically drop you down 2 floors, and floor 10 is a dead end! You want to find an updraft hole somewhere on floor 8 to push you upwards to an odd-numbered floor so you can pass by floor 10 as you descend, or get incredibly lucky and drop right past it. On certain floors of the Lake Mine you'll find an abundance of jewels. On the bottom floor of the Lake Mine is just a pond of water. In the water you'll find the Jamasquid, one of the uncommon King Fish. 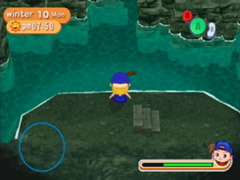 It swims near the northern part of the pond, so make sure you hold down the X button on your controller to force your cast to reach further out. Once you hook the Jamasquid, be prepared to press the X button a lot until you finally reel it in! You can ship the special fish for 1000 G, or cook it up in some tasty recipes.